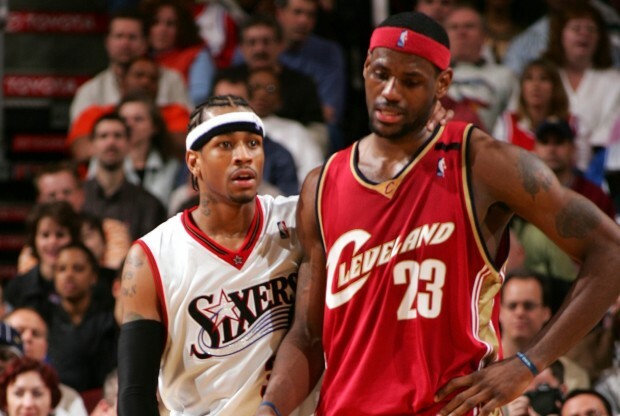 LeBron James Says Allen Iverson "Was a God"
There has been a lot of Allen Iverson chatter in recent days (don’t we all miss A.I. in our lives?) with the debut of the BIG3 league and Iverson’s first public appearance on a basketball court in about six years. As such, numerous players have shared their affinity for Iverson as a role model and someone that represented them as a black man who stayed true to himself in spite of all of his success and did it all his way. The biggest compliment of all may have come from the greatest player in the game today, LeBron James. RT SInow "High praise from LeBron James in SI_LeeJenkins' profile of the one and only Allen Iverson … pic.twitter.com/NZK9fofBNG"
There is no denying that Iverson inspired a generation and led a movement with his incredible style and flash as a player. He is someone who stayed true to his roots throughout his massively successful if not slightly truncated career. He also was an offensive force that could get into the lane and score at will despite his small stature for an NBA player that was realistically 5’11” and 160 pounds.A far cry from the physical specimen that is LeBron James. He represented a way out of the ghetto and rough surroundings for millions of kids around the country and world and he became their leader whether he fully accepted the role or not. All the 2000s era basketball fans have the opportunity to watch Iverson and many of his contemporaries compete in the BIG3 League this summer, no star will shine brighter or mean more for people to see on a court again than Iverson though.